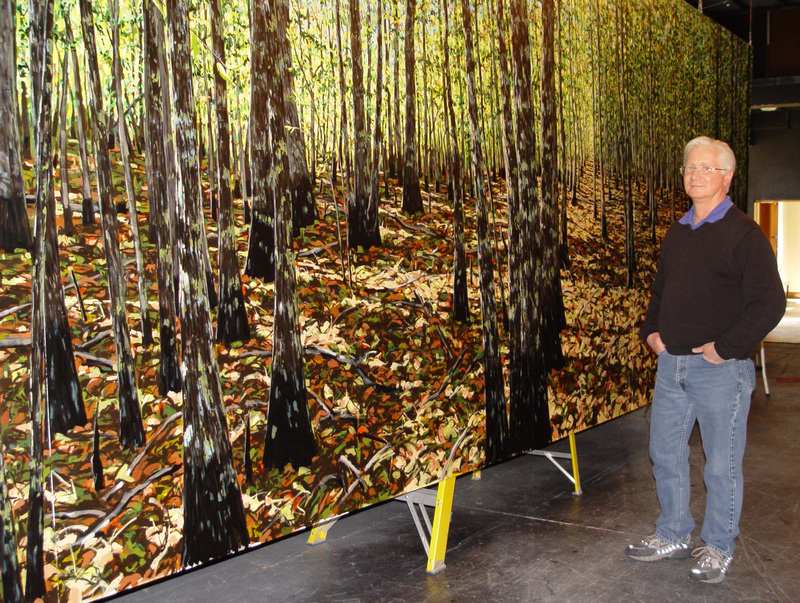 Arkansas State University art professor Roger Carlisle recently completed a project as big as all outdoors, almost. His task was to conceptualize, design, compose, and paint a mural measuring 8 feet tall by 24 feet long. The mural, entitled "Baseline in Louisiana Purchase State Park," celebrates the 200th anniversary of the Louisiana Purchase, President Thomas Jefferson's "noble bargain" with the French government that doubled the size of the United States. In 1815, President James Madison ordered a survey of the territory. The survey was measured from a starting point that is now in the Louisiana Purchase State Park, south of Brinkley. Carlisle was approached by the Central Delta Historical Society of Brinkley, which offered him the commission for the massive painting. Carlisle, who has taught at ASU for 29 years, is no stranger to large-scale projects; he designed the 1986 Arkansas sesquicentennial stamp for the United States Postal Service, which produced 150 million stamps from his original artwork. "Baseline in Louisiana Purchase State Park," has been installed in the recently renovated Brinkley train station. Carlisle began researching the painting in September 2002, visiting the site, taking photographs, and preparing studies. The painting took four months to complete, and as Carlisle said, "that meant it occupied every spare moment-nights, weekends. Every waking moment that I wasn't in class teaching, I was painting." "Baseline in Louisiana Purchase Park" was done in oils, using the techniques of impressionism and naturalism in the color palette. "It was an autumn photograph, so there are greens, browns, the ground littered with reddish-brown leaves, the leaves on the trees still green," says Carlisle. The massive piece was painted in six sections, each eight feet high by four feet wide. The sections are joined so carefully that the mural appears seamless. "The view is that of a line cut through a dry swamp, with tupelo gum and cypress trees, to the initial point at which the north-south and east-west lines converge, providing the baseline for all subsequent surveys that took place from Louisiana to Montana," says Carlisle. "It's basic swamp, covered in water part of the year, in the wet season. In the painting, the light comes from one side and sweeps across, so the cypress trees are dark, silhouetted against the light, and the tupelo gums are catching more light. There's a significant exaggeration of light and shadow. I stopped referring to the photo and chose to work from my own aesthetic sense," he says. Creating such a massive painting presented its own set of problems, however. Carlisle had to find a place big enough to work in that would allow him to look at the painting from a distance. Carlisle approached Dr. Les Wyatt, ASU's president, who found three possible sites. The pair finally chose the old auditorium in Wilson Hall, which was formerly used by ASU Theatre. ASU's Facilities Management employees hooked up adequate lighting, and Bob Simpson, chair of the ASU Theatre Department, agreed to help hang the painting from the rigging in the style of stage scenery. The painting surface was cabinet-grade birch plywood. "For a painting of this size, canvas tends to sag; wood panels are more stable," says Carlisle. He then prepared the surface with five coats of gesso, a thin paste composed of calcinated gypsum (plaster of Paris) mixed with sizing or glue, sanding between each coat "I probably used up to three gallons of gesso," he says. "It was like painting a room." Carlisle worked from a photograph, which he enlarged to 8 inches by 24 inches. Using a scale of one inch to one foot, he created a grid and divided the photograph into two-inch squares, which translated into 2-foot squares of the actual painting surface. Then, drawing freehanded, he limned his composition onto the surface. After the surface was prepared, and the composition delineated, the actual painting in oils began. "Again, it was pretty typical of the way I work, only larger," Carlisle says. "I built up my undercoats, working all over the canvas, adding color by color. I spent, for example, two days painting only a particular shade of green. An individual color might take me two or three days to apply." The large-scale work was fairly physically challenging, according to Carlisle. "I'd paint a little, get down and move the ladder, paint a little more, climb down, go to the back of the hall to look at it, see what I needed to do, and go back on-stage and up the ladder again. It was lots of physical work, especially for my shoulders and hips." "I am happy with the painting," he says. "It was hard work, but it was highly rewarding. I feel good about having done it." Carlisle earned the bachelor of fine arts degree and the master of fine arts degree from the University of Nebraska. His work appears in hotels, hospitals, banks, and corporate collections throughout the country.